Welcome to The Daily Wrap Up, a concise show dedicated to bringing you the most relevant independent news, as we see it, from the last 24 hours (1/31/19). I want to talk today about a steady and systematic eradication of independent media. Well not just media, but anyone who dares to speak against the establishment order, the official narrative; anyone who shows the smallest about critical thought or willingness to reflect on previous actions and mistakes of the government as it relates to the actions of today. One of these censor-worthy topics is how the US oligarchy and its allies are seemingly above the law. The very law they so sanctimoniously pretend to uphold, while violating daily with impunity. Disingenuously pretending to fight for democracy while partnered with some of the least democratic nations of today (as long as they play ball) while invading actual democracies, or those at least trying to be so, flawed or otherwise, all under a blanket of baseless accusations of the very crimes they allow their allies and themselves to commit. And the very institutions that the average individuals are told they can turn to for justice, for a redress of grievances, are either so corrupted and long-since been warped into nothing more than an institution of dutiful town-criers, or are indoctrinated to now see the very people their job requires them to protect as the enemy, and the document they sworn to uphold as outdated. Instead seeking to make a profit with the war on drugs, instead of fighting for those who cannot fight for themselves. Now whether it is due to the upcoming 2020 election or because we are beginning to take control of the narrative, despite their blatant and aggressive propaganda, efforts have clearly been ramped up, almost with utter disregard for how obvious and unconstitutional they may be. We are truly seeing a coordinated effort to stifle, suppress and outright shutdown independent media, and anyone voicing an opinion that counters the official narrative. This should be alarming to anyone who is cognizant enough to recall the countless times the “official narrative” — dutifully parroted by the entirely of the mainstream media — was shown to be misleading, incorrect, or an outright willful lie. 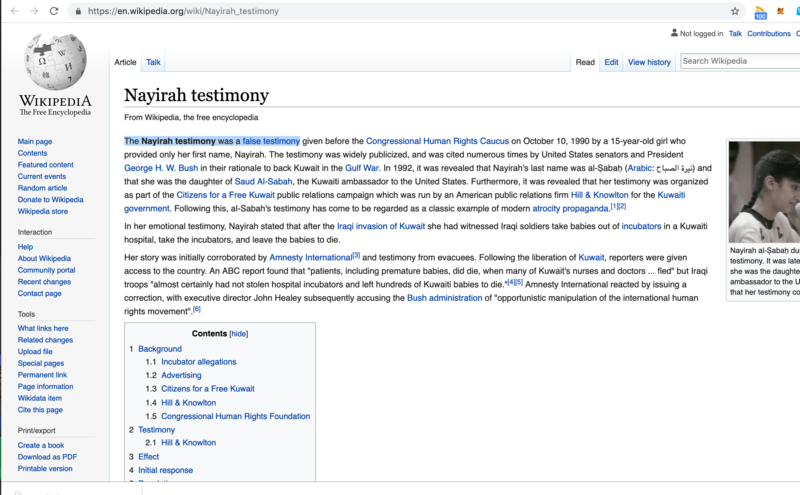 Of course in each of these examples those who dared to voice doubt in the government-sanctioned narrative were quickly labeled “conspiracy theorists.” Such as the NSA spying on Americans, such as arming moderate rebels, such as WMDs in Iraq, such as the lies about Libya, such as the entirely US government-fabricated Nayirah testimony that was used to get the US involved in the Gulf war. 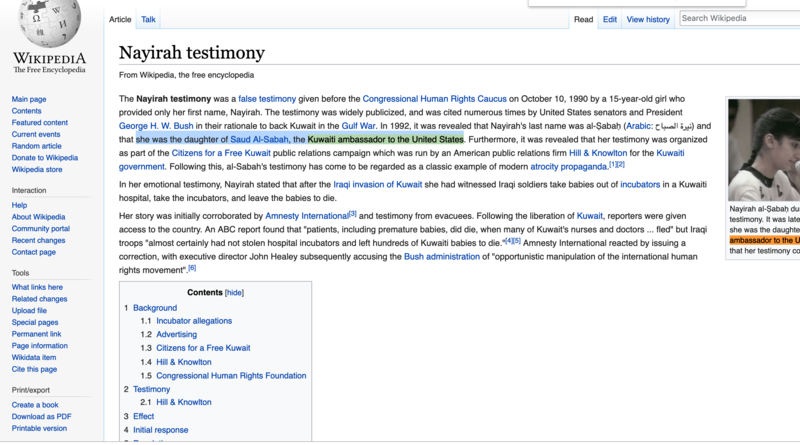 This is now a documented psyop, a lie, an orchestrated deception designed to manipulate the emotions of Americans in order to manufacture consent for a war with Iraq. Now remember that the very individuals leading the charge, of belittling and gaslighting anyone who spoke up in opposition to these now verified government lies, were the very ones who in most cases were well aware of the lies themselves. And here we are today, being systematically shut down, removed from the Internet, scrubbed from social media, forcibly removed from live press conferences in the public domain, in a gross violation of our constitutional rights. Consider all this in the context of what is happening today with Iran, with Syria, with Yemen, with Venezuela, and on and on. We just discussed how YouTube is now suppressing so-called “Conspiracy” videos, which is really just an excuse to ramp up actions against videos that counter the establishment narrative, especially if they are true. This comes up even as we were just talking about the FDA whistleblower who exposed that the FDA was colluding with Big Pharma at the expense of American safety, which is literally its only very job, and in doing so is by the legal definition called a conspiracy. This has been a long time in the works, day by day, bill by bill — the totalitarian tiptoe, the slow boiled frog — that most don’t even see what has been built around them, or worse, what has been slowly taken away. So it is time to speak up and recognize that you are no longer the minority. Recognize that if you do not speak up, that growing faction of opening minds may quickly change. So all of the topics in today’s show are a stark example of this suppression, this double standard two-tier system, and the methodical eradication of any willing to speak against the system.